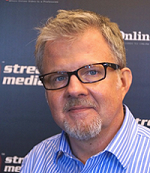 It seemed particularly fitting that, just as we were wrapping up this special issue celebrating 10 years of StreamingMedia.com, two of the most notable events in webcasting history took place. First was the March 3 kickoff of Oprah Winfrey’s eight-episode series in which she and author Eckhart Tolle discuss his "spiritual guide" A New Earth. Taking a cue from successful webcasts in the enterprise and educational sectors, Oprah’s Harpo Productions teamed with Limelight and Move Networks to make the webcasts interactive, allowing viewers to ask questions via Skype (which was one of the event’s sponsors) and email. Proving just how popular Oprah is (and just how hungry her viewers are for ideas like Tolle’s distillation of Christian mysticism and Taoist philosophy), more than 500,000 people watched the first episode, resulting in peak traffic of more than 242Gbps. Those numbers put it among the largest webcasts ever, which was both good news and bad. The good news is that at least a half million people found it easy enough to install Move Networks’ player and try to watch the program; the bad news is that many of those viewers experienced problems, while some were unable to watch the event at all. But unlike MSNBC.com when it webcast the Hillary Clinton/Barack Obama debate a week earlier—a webcast during which many viewers complained of stuttering video but had no idea what was causing the problem—Oprah.com anticipated potential hiccups and displayed a message to anyone who couldn’t view the webcast, explaining that the problem was due to capacity issues and directing those viewers to places where the program could be viewed on-demand or downloaded later on, including as a video podcast from iTunes. The following week, 200,000 people tuned in again, and Limelight reported no problems. While on-demand and download numbers weren’t released (beyond iTunes ranking it as the No. 1 podcast for the week of March 11), it’s safe to say that many of the viewers who tried to watch the first episode simply decided they’d rather forego the interactive features and watch the second episode at their leisure. For now, at least, webcasting a live event to an audience approaching that of a typical network television program remains a pipe dream, but to dwell on that misses the point. Online video offers interactivity and flexibility that television can’t match, and for a relatively large number of people, the barriers to entry have fallen by the wayside. To paraphrase Al Franken’s Stuart Smalley—a character that poked fun at exactly the kind of self-help guru of which Oprah’s audience is so fond—it’s easy enough, good enough, and doggone it, people like it. What was most impressive about both of these events, though, wasn’t the technology or the scale. Only a cynic like Franken could miss the point that each of these webcasts put streaming to use in the service of something beyond business or technology; although Oprah’s webcasts had three relatively unintrusive sponsors, both events were offered free of charge to viewers. We spend so much time debating how best to monetize what we do that we sometimes forget that generating revenue isn’t online video’s only purpose. And the fact that webcasting is relatively inexpensive compared to traditional broadcasting makes it a much better video medium for delivering messages that serve some sort of higher good. It’s that commitment to something beyond self-interest that marks each member of our inaugural Streaming Media All-Star team (pp. 62–82). In addition to advancing the business and technology of online video, they’ve given their time and talent to help others in the field learn how to best use online video to do their jobs better and better serve their stakeholders in the enterprise, the academy, or the general public. They’ve all looked beyond the bottom line and, in the process, taken streaming media to the place where events like Operation MySpace and Oprah’s online course—events that arguably make the world a better place—are not only possible but successful.